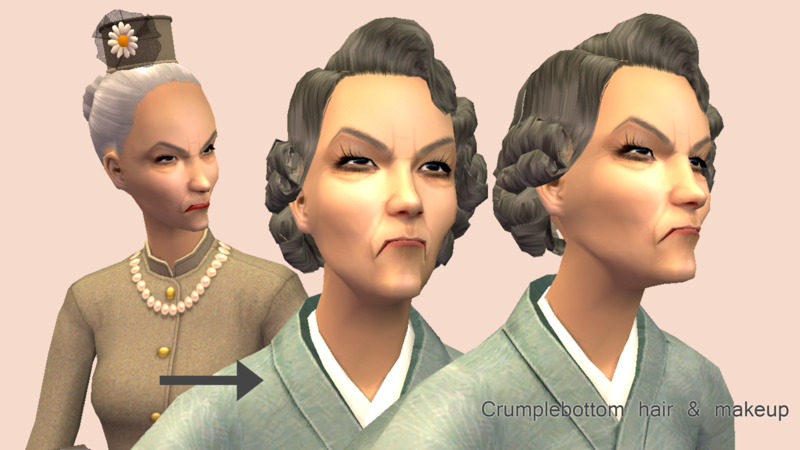 I finally got these NPC replacements I mentioned in my last upload to work! I've been meaning to do these for a while to be fair. 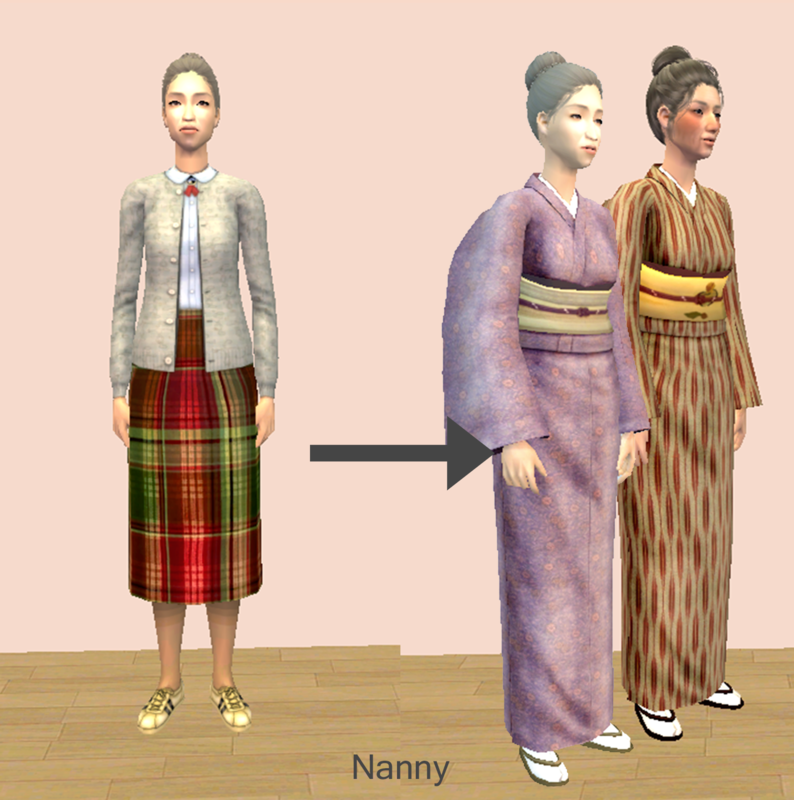 I was watching When Marnie Was There and got the idea to default replace the Nanny NPC to wear a kimono, like the nanny in the film. Then when the Mrs Crumplebottom challenge was on recently, I thought, oh! 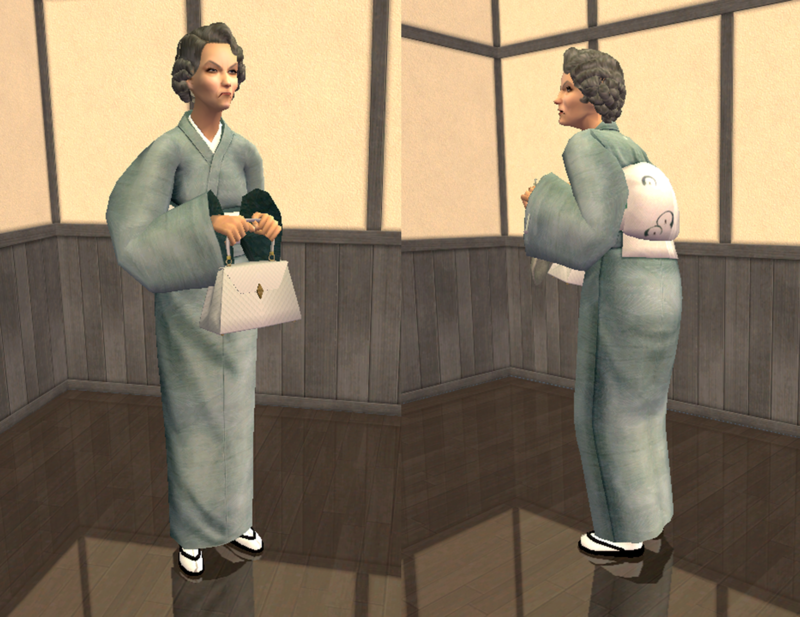 I could replace Mrs crumplebottom and the Nanny with kimono too! 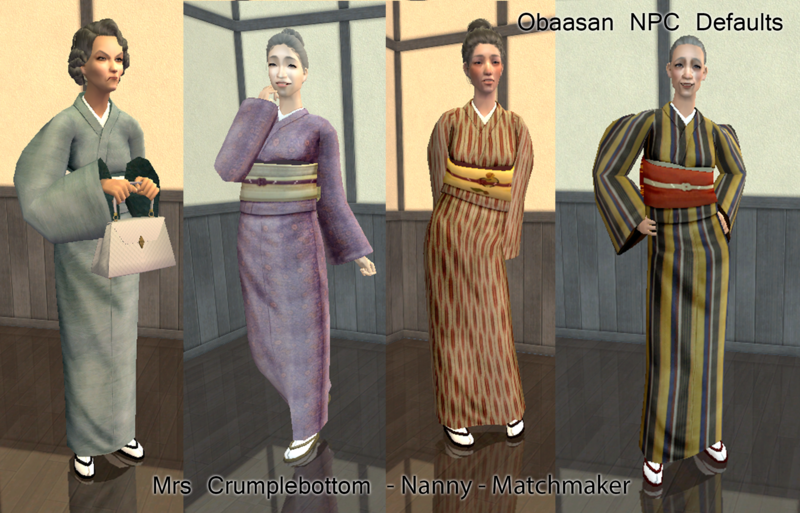 What we've ended up with here is Mrs Crumplebottom, Matchmaker and Nanny outfits replaced with my fashionable obaasan kimono retextures; edited replacements of Mrs Crumplebottom's handbag, knitting, makeup, and the matchmaker makeup; Crumplebottom's hair replaced with 3t2 Roaring heights Established Tight Wave by Rented Space; and the matchmaker's hair replaced with Trapping's pulled back bun pookleted by almighty hat. All these replacements are seperated with each NPC in its own folder, and each element in a separate package so you can pick and choose which parts you want, and download different defaults or keep the originals of certain parts if you so desire! 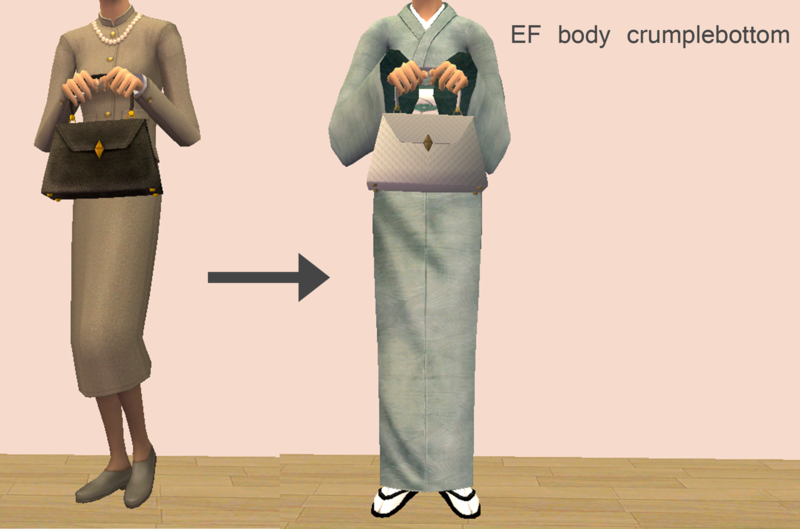 All meshes are included in the respective packages. 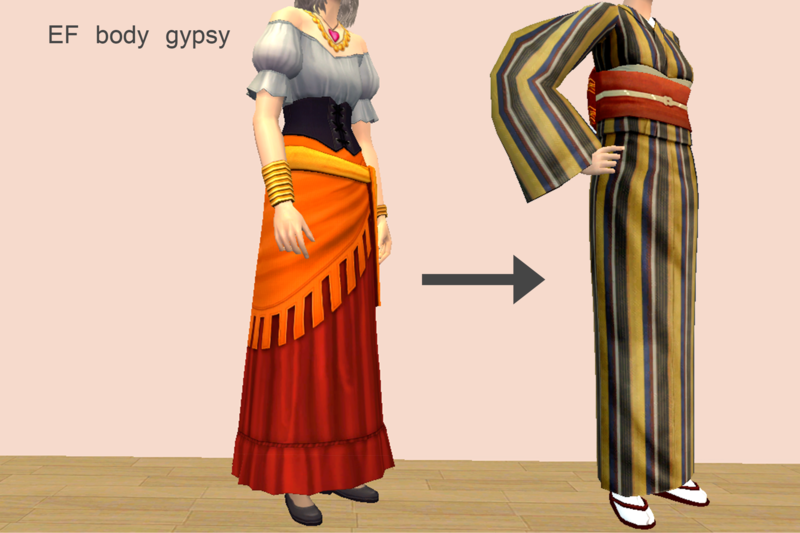 See above for where to find the custom versions of the outfits and hairs! 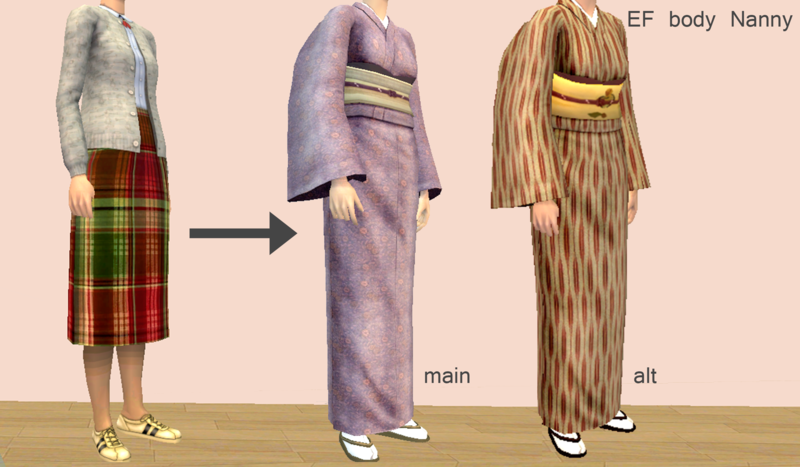 For all the kimono replacements, You'll need the Happy Holidays SP. 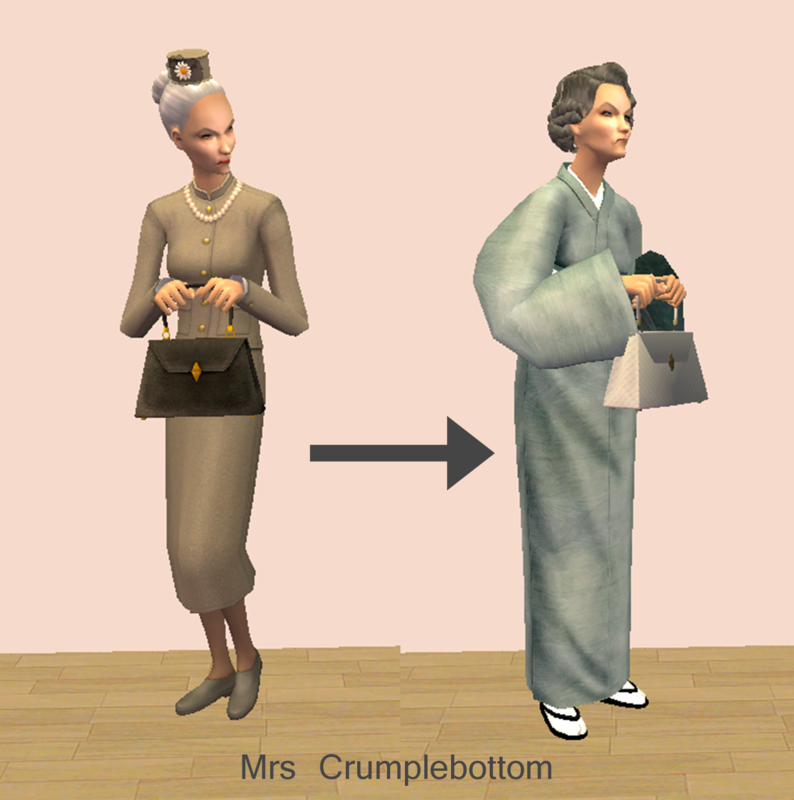 To get Mrs Crumplebottom you need nightlife, and to get the matchmaker you need nightlife/freetime. 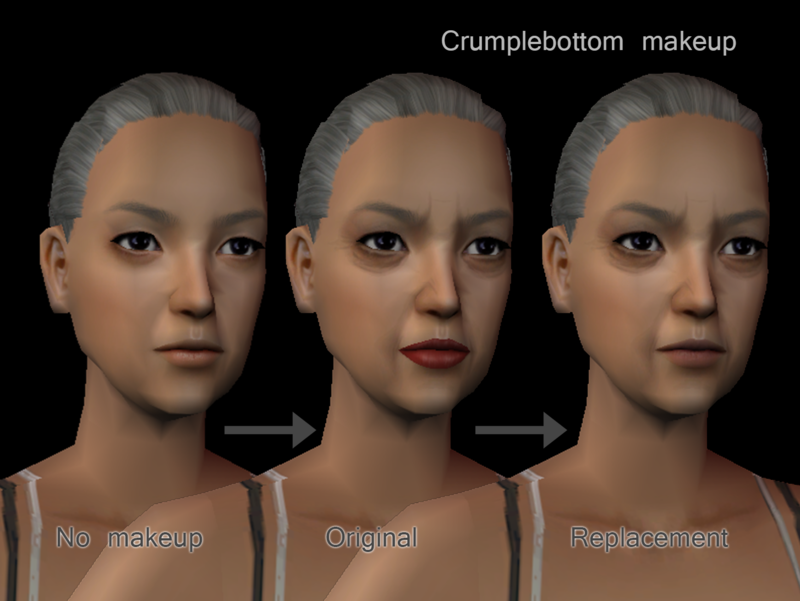 to make the makeup edits, I used DigitalAngels' Maron-Trapping-Nabila-Helena-Tifa lipblend to replace the lips. 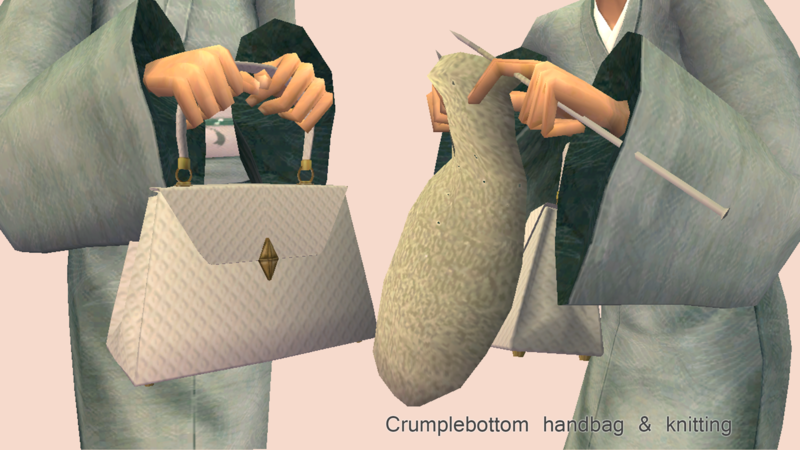 The rest of the textures for the makeup, but also Mrs Crumplebottom's handbag and knitting, are my own edits of maxis textures! Same policy as usual for those, you may edit them to your heart's content but please do credit this upload if you upload em! 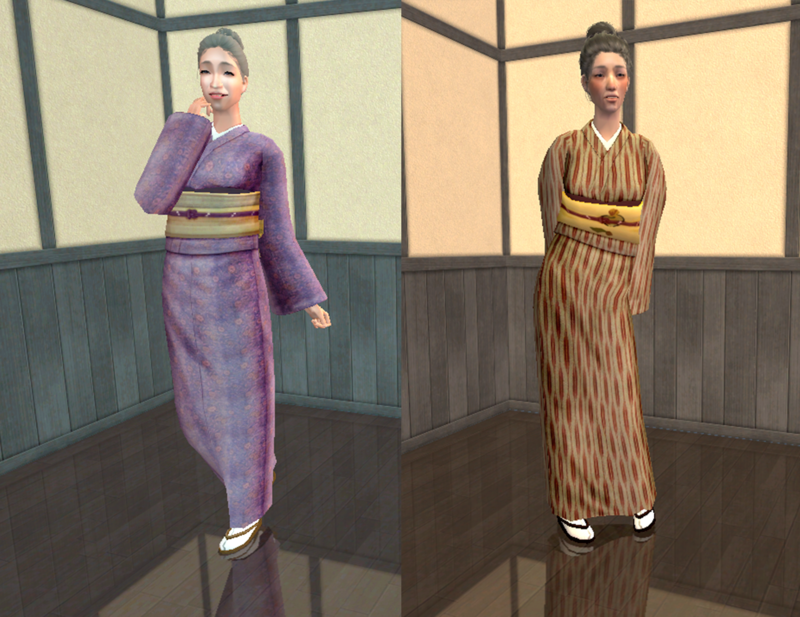 Note: I use my own default replacement skins which are defaulted versions of DigitalAngels' asian skins that I made myself, but haven't uploaded (as I figured not many people go for an entirely Japanese themed hood like I do! 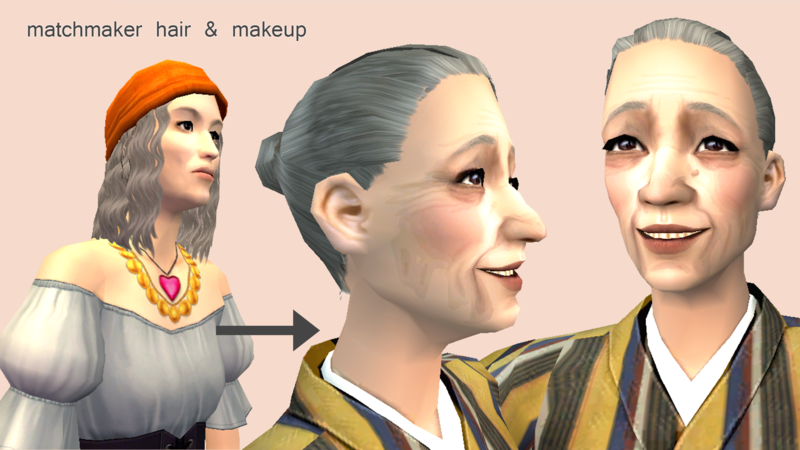 so there wouldn't be any need to upload it), plus default replacement eyeliner (that Mrs Crumplebottom is sporting, magnetomic's default of Lilyth’s Advent eyeliners), and defaults for most hairs, hence the nanny's hair. So please do consider this for how it'll look in your game! 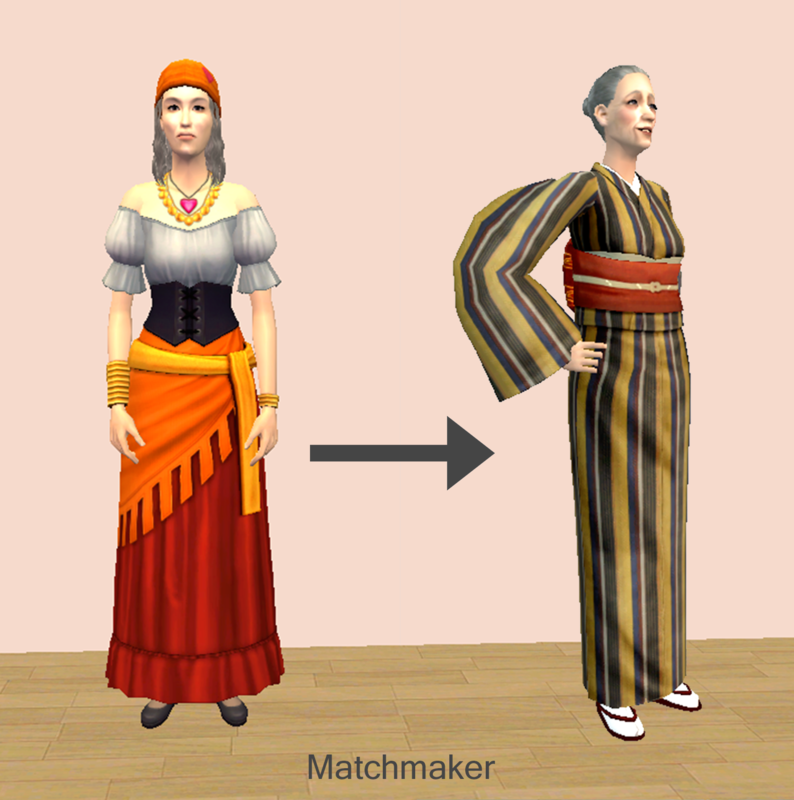 Also, for some reason my Matchmakers are spawning without makeup, which I'll fix at some point, but the default makeup definitely works on account of showing in bodyshop, and the model sim I'm showing here is a recreation I've made myself. That's why the Matchmaker in the before shots has no makeup. 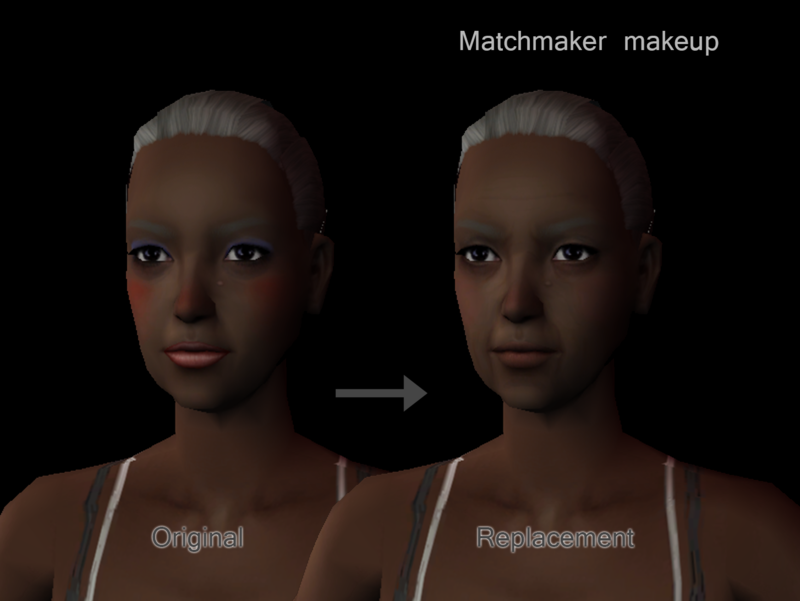 I'm aware that there's a matchmaker that spawns with dark skin, so I've included a BS preview of the makeup on dark skin, too.